This Gerber Propel Downrange Automatic is a fast and sleek knife, built with the user in mind. The Propel Auto features a slender body and multi-position pocket clip, allowing the operator to carry the knife however they see fit. It has a tanto style steel blade with a stonewashed finish and a plain edge. 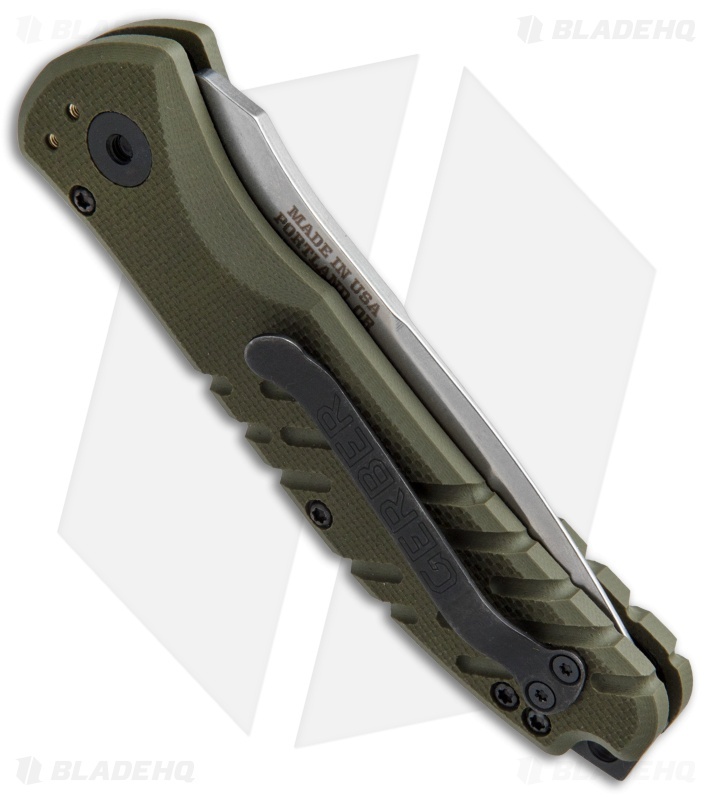 The handle is comprised of steel liners and pommel along with grippy OD Green G10 scales. Push-button action with a plunge lock and safety switch finish off the design. Proudly made in the USA. I bought this knife as a everyday work knife. It's as tough as I expected and seems to be well constructed. I have no complaints about the handles, opening, or locking. Reason for 3 stars is the blade. It's a good quality steel, but the grind that came on the blade from the factory was terrible. I had a hard time using it and it was VERY disappointing especially given the price tag. Also the grind on the blade bevel was visibly uneven. I considered contact Gerber or getting a refund from Blade HQ but since I really liked the rest of the knife I decided to work on the edge myself. I spent the time to re-profiled the edge and after a ton of sharpening, I'm satisfied with it. Tanto blade are a bit of a pain to work on for me but I'm happy with it now. Unfortunately, after this experience, I don't think I'll be buying another Gerber. 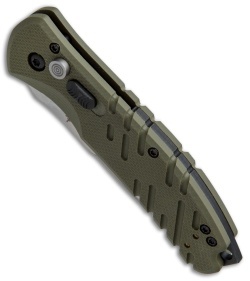 It is an ok auto for the size but would not be my first choice for EDC out of uniform. The opening is relatively slow and I had to loosen the bolt a bit in order to allow it to lock when opened. Color is amazing and the stone wash finish is beautiful. 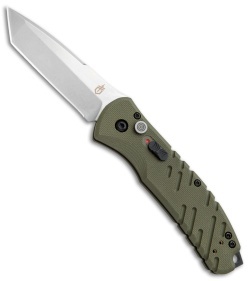 Handle is very sturdy and the G10 grip feels nice. switch locking is very easy to use and feels natural. I consider myself a fairly good judge of quality when it comes to blades. I purchased this after reading a bit about it elsewhere from BladeHQ. I must say, I am nothing but impressed. Lockup is solid, spring has plenty of power, handle grips well and is comfortable, and the safety has a very positive engagement click felt in the on or off position. I'm not new to autos, and I will have to say this knife is worth every penny. It is a larger knife, which I was looking for. 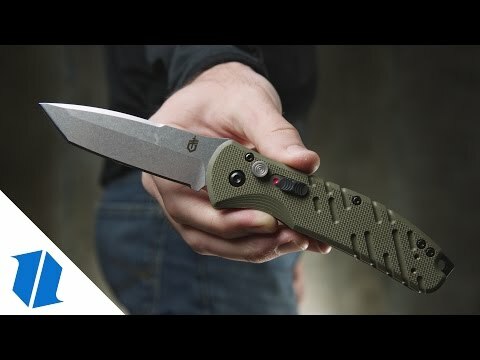 i collect high-end knives and pulled the trigger on this knife when i saw the video. when it got here ,and i looked it over? what a pleasant surprize! the fit, finish, and quality is outstanding! very impressive! 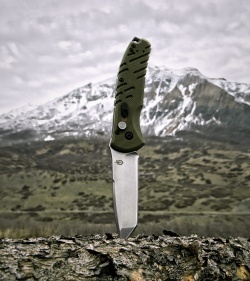 this knife is in the same category as my chris reeves and striders! great job gerber!